OK, I am going to attempt to tackle the subject of Dependent Origination. Wish me luck! I can tell you I have been doing a lot of reading on it, and trying to make it understandable for myself is quite the challenge. What I do know, is that is is a core teaching of the Buddha. It also reveals the way of breaking the chain and putting an end to the process of Samsara. It seems to me that this teaching is like a road map of the coming and going, and connectedness of all things. The cause of our suffering, Kamma (Karma), cessation, realization, these are all laid out for us. 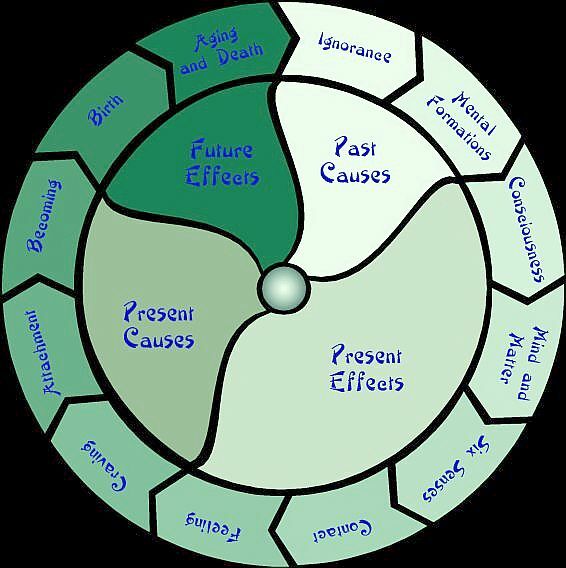 Causality is the relationship between an event (the cause) and a second event (the effect), where the second event is understood as a consequence of the first. This has many scientific and psychological explanations, but I think that the Buddha took it one step further. Now not being a Scientist, Psychiatrist, or Buddhist Monk, leaves me highly unskilled and unqualified to break it down for you. But I think if I can start to at least have some small awareness and understanding, it can be beneficial to both of us. Let’s try together. Karmic formations: As long as there is ignorance there is the formation of kamma: positive, negative and neutral. Sensation: From contact arises sensation: pleasurable, painful and neutral. Craving: One then develops a desire not to be separated from pleasurable sensations and to be free from painful sensations. Grasping: As craving increases, it develops into grasping, i.e. actively striving to never be separated from what is pleasurable and to also avoid what is painful. Old age and death: The chain comes to old age, sickness and death. The Kamma (Karma) of one life sets in motion another life, rooted in ignorance (Avijja). Sounds pretty bleak doesn’t it? But this is reality. Unless we break the chain, the rules of causality will prevail. You are born, you suffer, you die. Now I have no way to know if we all come back to do it over again based on our Kamma. But whether I do or not, I would truly like to break this chain this time around. So I will stop for now, because I know this has been a long post, and a lot to take in. But I hope we can both start thinking about this, and start to nibble away at these chains that bind us.